We’re excited to launch a complete redesign of USDA.gov featuring stronger visual storytelling components, a more modern user-experience with easy to find services and resources, and to top it off, a completely mobile-friendly design. Through careful planning, thoughtful design, and a primary focus on user experience and usability, we’ve taken the best of government and industry expertise and put it into creating our new website. This has been a year-long project, but to do this right, we wanted to make sure we tapped into every possible resource. Throughout the year, we conducted workshops to help define our audiences and develop a new way of organizing the information that matters most to you. We looked at every piece of content and took a ground-up approach to how we manage and deliver that information online, conducting user-testing to refine our strategies, and working with industry experts to bring those plans to reality. The result was Drupal, our new Web Content Management System. We created a framework for an Enterprise-wide platform that allows for all of USDA websites to share and grow together and to manage content in a way that breaks down internal silos and optimize collaboration. One of our first case studies testing the Drupal system, was with the creation of the New Farmers website. At the same time, we were working to redesign our website, the U.S. Web Design Standards were being drafted, so, we were able to take those guidelines and build the New Farmers website, a one-stop resource to help those who want to begin farming. 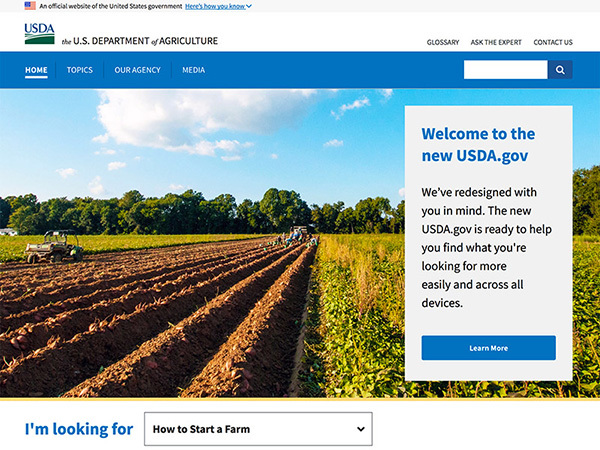 The New Farmers website paired with Drupal proved to be a great launchpad for what was to come, the redesign of USDA.gov. Using Drupal, we created a completely responsive website, which means what you see on your desktop computer is the same content you’ll see on your phone or tablet, not just a “mobile version.” Give it a try. If you’re on a computer, grab the corner of your browser window and change the size of that window to make it smaller. You’ll see the website shift around and recreate itself to fit into what you would see on your phone or tablet. This is just the beginning so we need your help to making us better. While browsing USDA.gov, scroll to the footer and look for the feedback link. Please send us comments if you encounter an error or have suggestions for improving our website. We’d love to hear from you as we continue to improve the website for years to come.